A Myanmar Christian leader appealed for calm Wednesday after an influential Buddhist monk built pagodas within the compound of a church in a country beset with religious tensions, reports News Republic. Supporters of the monk Myaing Kyee Ngu erected a religious statue and planted a Buddhist flag on a church’s grounds in the eastern state of Karen, and then returned on Saturday to erect a pagoda, according to local Anglican Bishop Saw Stylo. 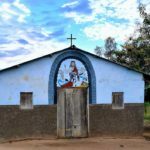 It is not clear what is behind the recent pagoda construction in Karen state, which has a sizeable Christian population. Christian communities in ethnic minority areas have for years complained of encroachments by zealous Buddhists, particularly through the presence of the military. The office of local MP Saw Chit Khin said that Buddhist authorities had already written to the monk to urge him to cease building.